Extracted from the leaves by steam, the pale straw-coloured sage essential oil is warm and spicy with a sharp smell, and is watery in texture. Unlike other herb oils, this is not taken internally. It is a strong herb, and is inhaled through aromatherapy and applied to the skin. It's usually extracted from common sage (Salvia officinalis). This is the type most often used in cooking. More on the plant. The leaves of the sage plant often feature trichomes, or small hairs, and that is where the cells that produce the extract can be found. 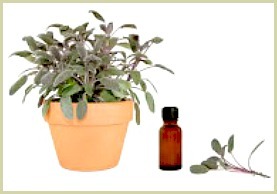 Note: Make sure that you are careful about diluting sage essential oil. The fragrance is powerful, and is best used in aromatherapy at one per cent or less. Do not use if pregnant, or if you have high blood pressure. As always, take medical advice if unsure. ...You could always grow sage herbs for use in your home cooking. There are 750+ varieties and the woody shrubs grow in most warm climates, with flowers ranging from mauve, purple to blue and white. If you have a sunny spot in your garden or containers on the patio, it's quite easy and worthwhile. See my growing page for detailed steps and advice. Another way of enjoying sage health benefits is to brew a potent cup of sage tea from the fresh or dried leaves. Turmeric - The Extract From the Healthiest Spice of All!